I lived in Calgary from 2009-2012, during which time there were only 4 microbreweries and brew pubs: Big Rock, Wild Rose, Brew Brothers (now defunct) and Brewsters (a Western Canadian chain of brew pubs). Alberta has been a little slow finding its way into the craft beer industry due to some laws that were unfavourable to small batch brewers. 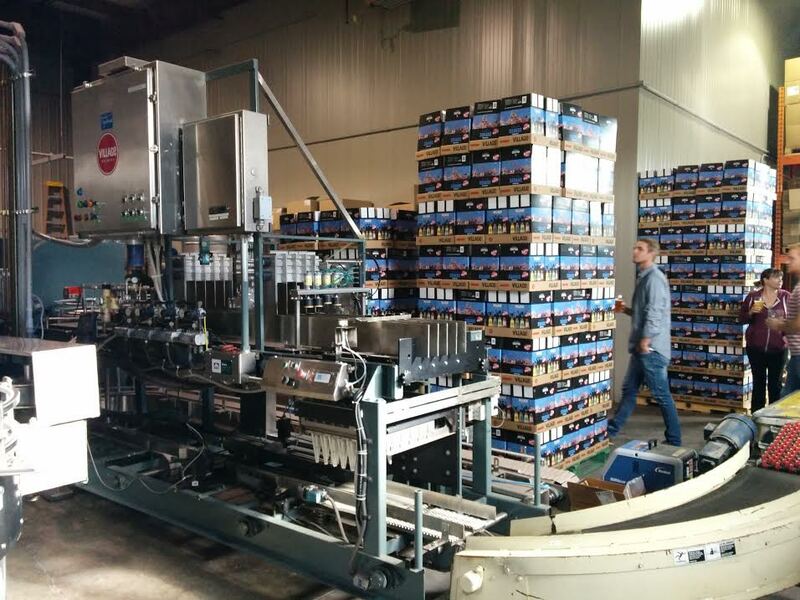 Minimum production capacity requirements made it extremely expensive to start up a brewery. It was a shame. Alberta grows some of the best barley in the world. Retail liquor operations have been privatized since 1993 (thank you Ralph Klein!) and Albertans drink a lot of beer! The archaic liquor laws were eliminated in 2013, and Alberta’s brewing scene has been growing since then. 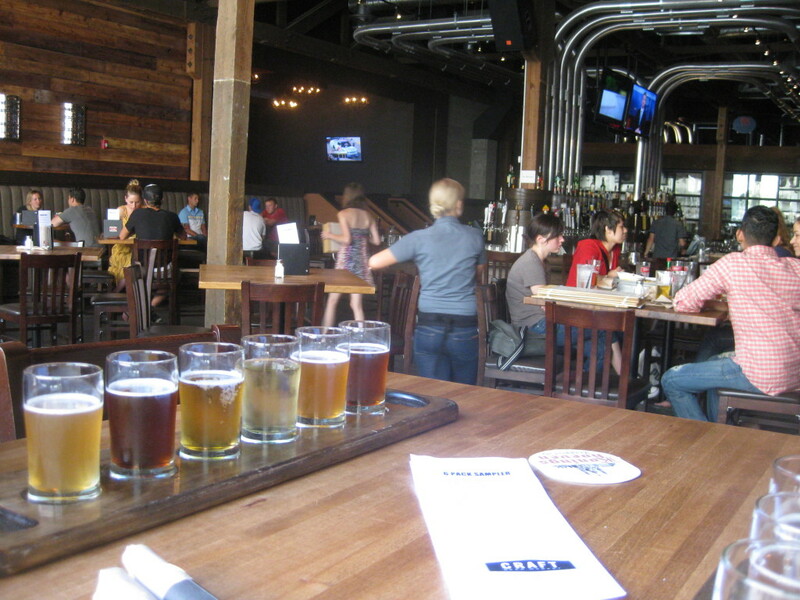 On my trip to Calgary last month there were 8 craft breweries and more on the way! I started following these guys on Twitter shortly after I left Calgary and they were still literally brewing out of a tool shed! Owners Graham Sherman and Jeff Orr were instrumental in lobbying for changes to Alberta liquor laws – which had forced them to partner with a BC brewery and import their beer to Alberta. Now they have an awesome brewery right in Calgary! The brewery is all hand-built. Barn wood is used, as well as old barn doors which have been converted into tables. There is lots of seating, a projection screen, a foozeball table and space for a band/DJ to set up. Oh, and they have party lights! This would be an excellent place to throw a party! And thanks to the new liquor laws (or lack thereof) you can just drink a pint, hang out and watch the brewing process. Graham was nice enough to invite me on a private tour and I’m glad I went! Graham is such an entertaining character, obviously passionate about everything that he does. Tours happen every Saturday at 2pm and are $15. You can book your tour here. Tool Shed currently makes 4 beers, which you can read about here. 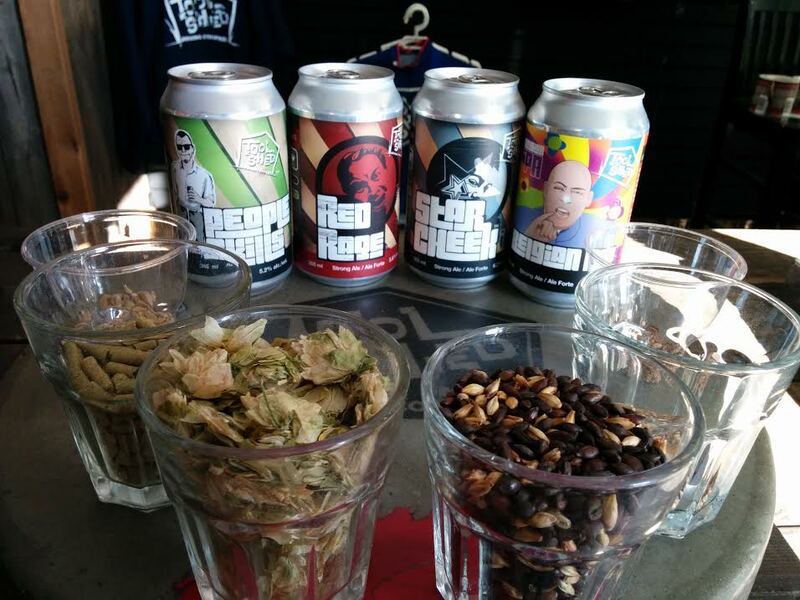 My favourite is the Red Rage, which was the first beer they brewed back in the tool shed. It’s roasty and toasty with “just enough” hops. Another popular brew around town is People Skills – a smooth, crisp cream ale. Village Brewery was founded in 2011 by a group of partners who wanted to start a community brewery supportive of local arts and culture. The tap room is an art gallery showcasing artists for 3 month intervals, and even the beer cases and merch are designed by local artists. 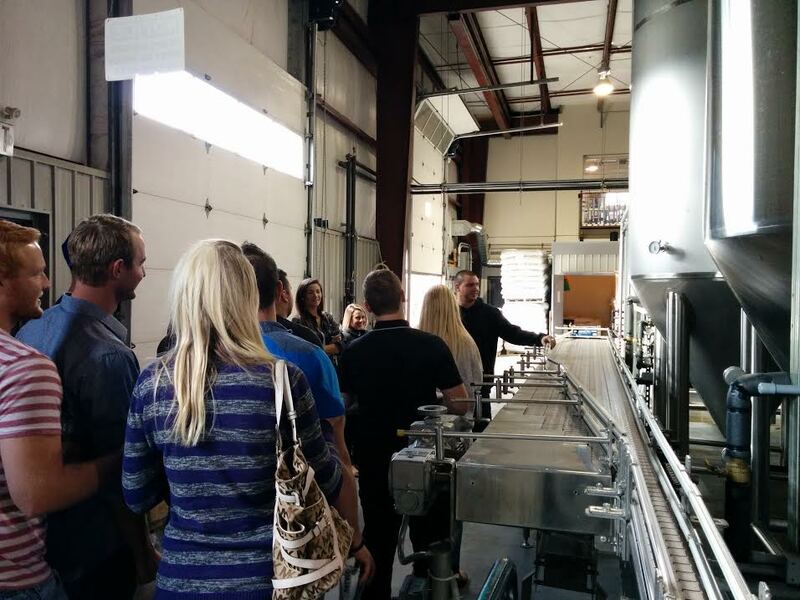 Village Brewery offers tours on Saturdays at 12:30pm and 2:30pm. All you need to do is e-mail the brewery at tour@villagebrewery.com. The tour is $15 and includes samples, a pint of your favourite beer and the beer glass it’s in. There is also a store where you can buy t-shirts. We got to try 5 beers while on tour at Village. A blonde, a white wheat ale, an India session ale, a red and an India black ale. My favourite was the India Session Ale because I enjoy a bit of hops. A common theme I was hearing from brewers is that hop bombs haven’t really exploded on the scene in the same way they have on the west coast. Rather than celebrating hops, there was much more enthusiasm about the amazing local barley. I noticed that a lot of the beers had malty characteristics rather than being hop-forward. Village’s Blacksmith has a bit of a kick to it, though, and seems to be quite popular around Calgary. I would see people show up with it at parties, and hear people swoon when I mentioned it. This is a black ale – full of flavour but still pretty light and drinkable. Wild Rose has been around since 1996, and moved to an old air force hanger in Currie Barracks in 2006. This location is now home to their tap room. In a recent expansion, the majority of production has moved to a shiny new facility in the Foothills Industrial Park, but the barracks location is home to their innovative program under the direction of brewer Mark Kerrigan. Tours run on Wednesdays at 7pm and are $29. More info here. The tap room at Wild Rose. The taproom is known to serve up some delicious food, so come hungry. There are special beers and casks only available on site! The most popular Wild Rose beers are probably the WRaspberry Ale and the Velvet Fog. Velvet Fog is an unfiltered ale made from 50% wheat malt and 50% barley. It is hazy and golden, and slightly tangy. A mix of these two beers is called a “Pink Velvet” on the mixing menu. Some other notable brews are the Cherry Porter (a seasonal, made from BC cherries), “Alberta Crude” Oatmeal Stout, Big DIPA, and WRed Wheat. 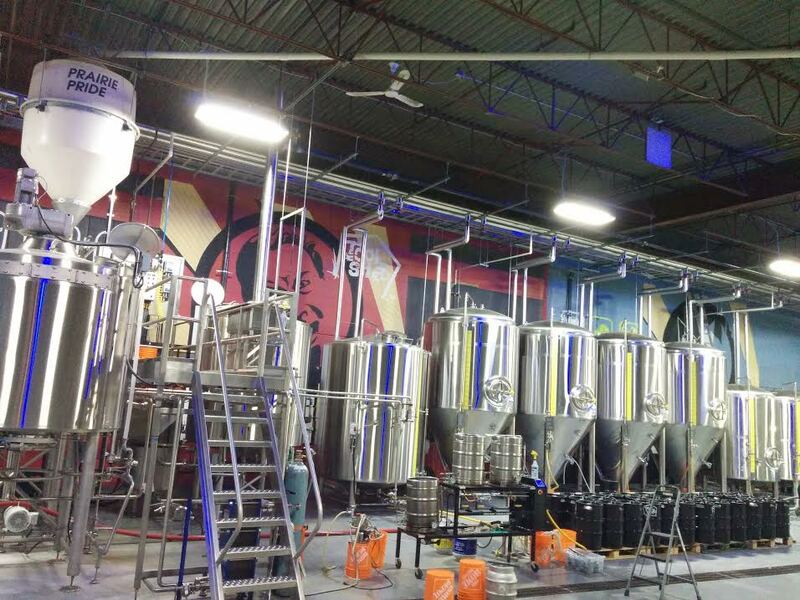 Last Best Brewing took over the space on 11th Ave SW that used to house Amsterdam Rhino, Brew Brothers and District. This is the fourth location of the Bearhill Brewing Company, which also has breweries in Banff, Jasper and Fort McMurray. While I definitely will miss hanging out at District and drinking Brew Brothers’ black pilsner, Last Best Brewing is a worthy addition to this neighbourhood and to the Calgary beer scene. The beer menu is divided into “Here to Stay” and “Here to Play”, with their mainstay beers comprised of Show Pony Pale Ale, Last Best IPA, There Will Be Porter, Olsch Kolsch B’Golsch, and Dirty Bird Black Lager, which is, perhaps, a shout out to the black pilsner that used to be brewed in the same building. To my knowledge, Last Best is the only brewery in Calgary serving nitrogen beers. Of interest during my visit was a Nitro Stout, a nitrogen Caramel Latte Beer and non-alcoholic nitrogen cold brew coffee. Last Best is a brew pub with a full food menu. Dandy Brewing is Calgary’s first nano brewery and produces British inspired ales in very small batches. They consistently make a stout and a pale ale, but otherwise specialize in one-offs. Dandy Brewing is located in the building in the background. The tap room was not open for business yet when the Dandy guys invited me to hang out at the brewery, which is tiny and custom built. 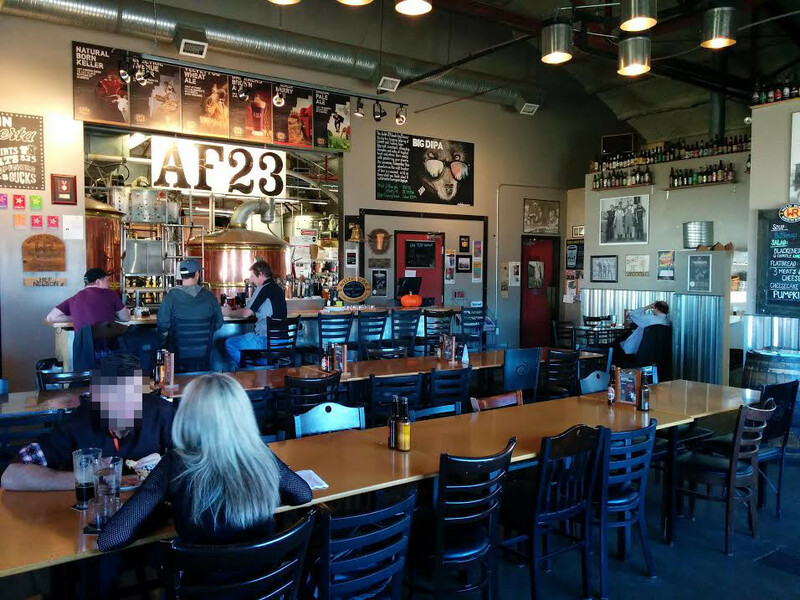 The tap room holds about 20 people and also sells growlers and 650 ml bottle-conditioned bombers. This is where you should go if you want to try Dandy’s rare, one-off beers that you won’t find in stores. By the time you are reading this, the tap room should be open. Big Rock is the biggest and oldest craft brewery in Calgary (since 1985) and most well known for Grasshopper (a filtered wheat beer) and Traditional (a brown ale) known by locals as “Trad”. But Big Rock is so much more than Grasshopper and Trad. They have a huge roster of beers now, from creative craft brews to cheap pull tab beers. Tours are $25 and generally fall on Thursdays and Saturdays. Click here for more info. 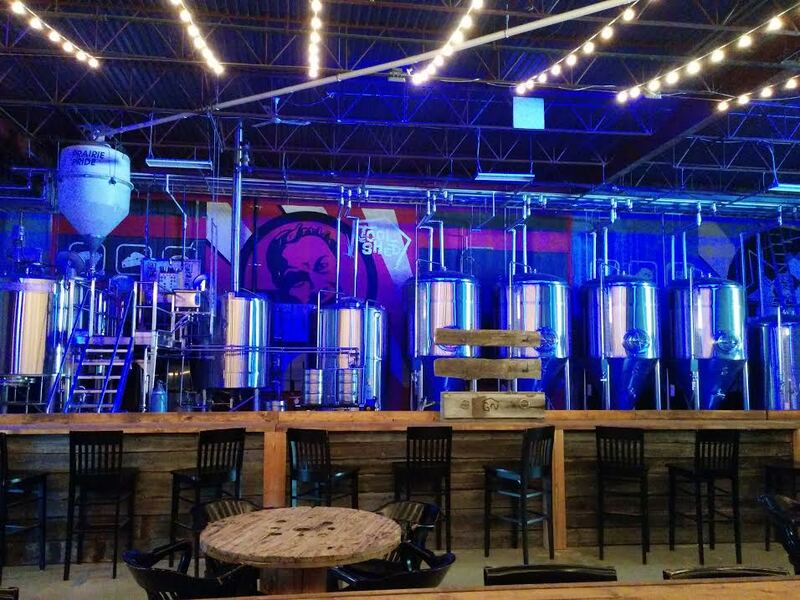 Brewsters is a brew pub with locations all across Alberta. Previously you could only drink their beers on-site at their pubs, but with changes to the liquor laws Brewsters can now sell bottles out of their restaurants. They are bottling 6 of their brews, and there are an additional 6 (+ seasonals) that you can only enjoy on-site. My favourite has always been Rig Pig – partly due to the name, but also because I enjoy pale ales. Brewsters makes 3 lager style beers, 2 fruit beers, 2 styles of wheat beer, an IPA and a few darker options. Minhas was started by siblings Ravinder and Manjit Minhas, two petroleum engineers who took advantage of Alberta’s liquor privatization by importing booze across the border and selling it at deeply discounted prices. The company they started was Mountain Crest Liquors Inc., and they are responsible for the likes of Boxer beer. Manjit is actually a Dragon – yeah, like on Dragon’s Den! 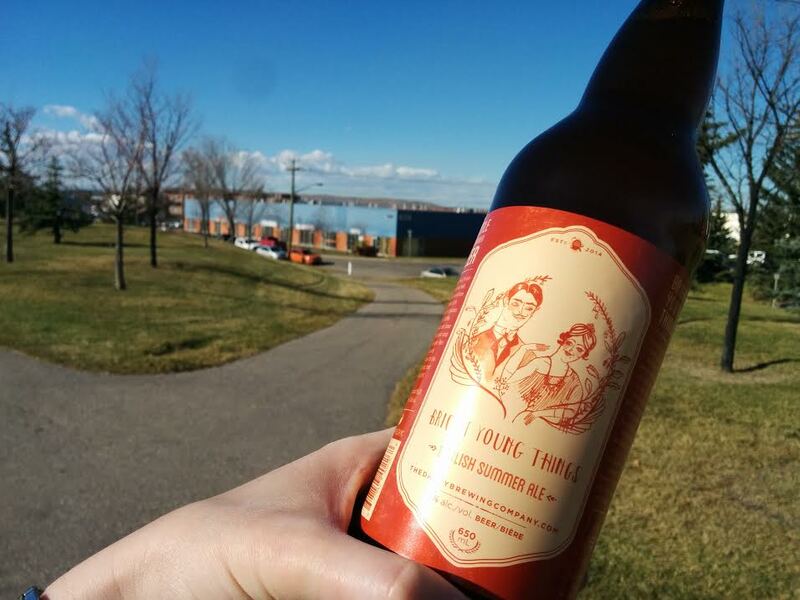 Even though these guys are more on the big business side of things and have been brewing out of the states, they have recently opened a microbrewery right in their hometown of Calgary, where they are cashing in on the craft beer trend. Tours are available Tuesday-Saturday (12:30pm, 3:30pm, 7pm) and are $10. Connected to Brewsters, this bar specializes in imports and local beers. 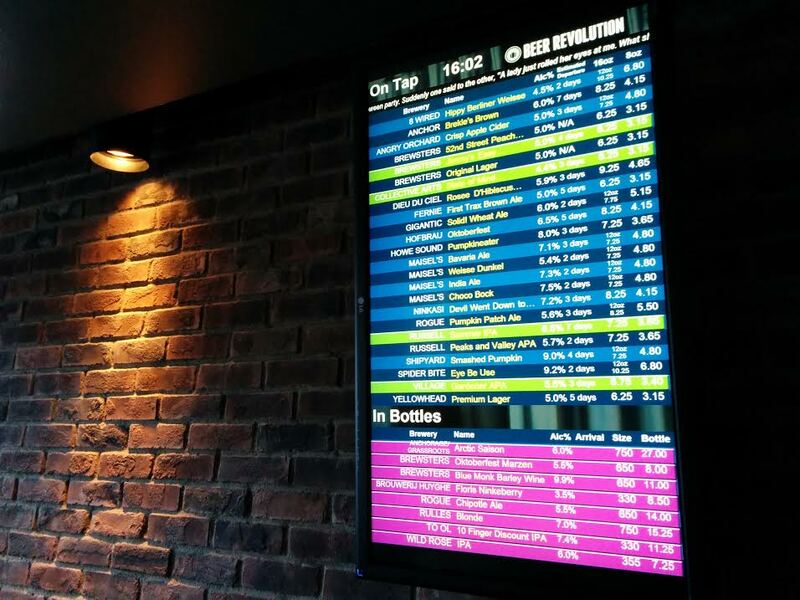 They are displayed on a screen that resembles the departures and arrivals screen at an airport! Info is listed such as place of origin, Alc%, the date it was tapped and the expected departure date. Specials are in green! The menu specializes in gourmet pizza. This is a very popular and very “Calgary” bar. They describe it as “premium casual” which I think describes a lot of bars in downtown Calgary, which are large spaces with televisions and a certain corporate shine. Craft played a big role in nurturing the craft beer movement that Calgary is currently enjoying, and they have already expanded to Edmonton, Vancouver and Ottawa. 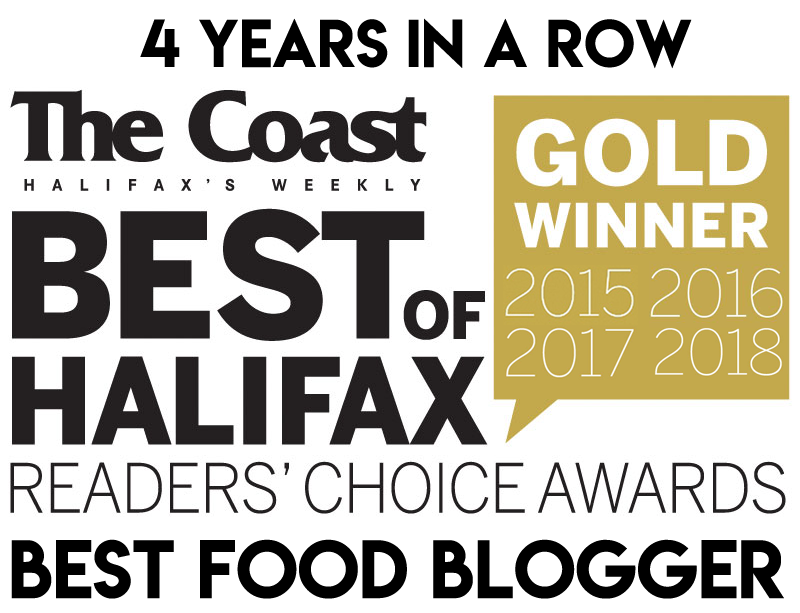 They hold brewmaster dinners and use fresh, local and sustainable food. You will find lots of local taps here, but the beer list is simply overwhelming with over 100 beers on tap and a keg room that can hold 250 kegs! There are 3 Nationals in downtown Calgary! One of them is right in the core, catering to the business crowd. The 10th Ave location is right next door to Craft and features a bowling alley. But I hear the 17th Ave location is the most fun. There’s also a suburban location in Westhills. I only had a chance to visit the one on 8th. It was very much a typical flashy Calgary bar. With good beer. This place was recommended to me by some brewery guys. This is a casual spot in Kensington with an emphasis on local beer & food. They have 12 rotating craft beers on tap from local breweries. I think they do a better job at supporting local than the bigger bars. 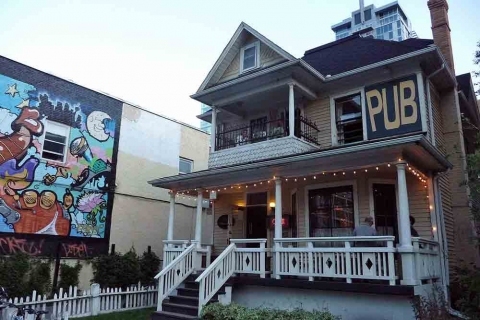 No list of Calgary bars would be complete without this most quintessential pub. Unlike some of the other bars on this list, the Ship is well worn and lacks airs of pretension. Plus, there is a surprisingly good tap list comprised of imports, nationals and locals. 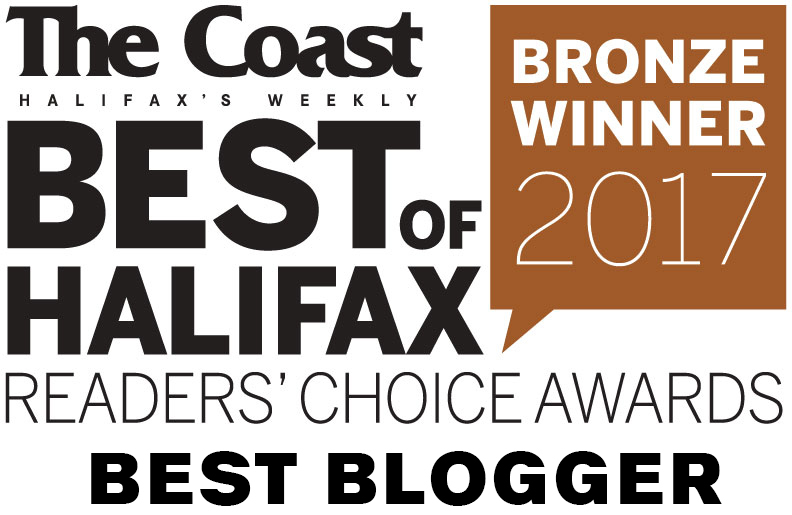 They carry Big Rock, Last Best, Village, Wild Rose and Alley Cat (Edmonton). 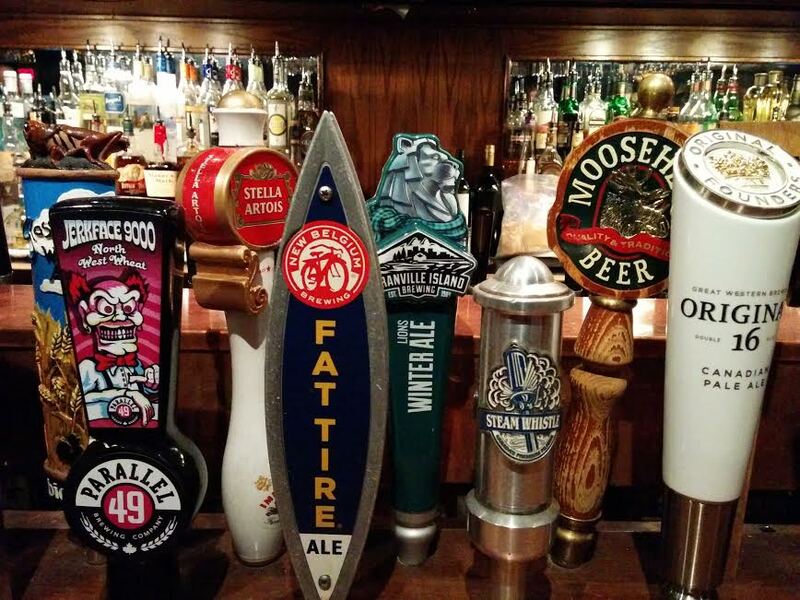 You will see everything from Granville Island, to Steamwhistle, to Unibroue to Moosehead. If it didn’t have the word “PUB” slapped against it, you would think this was just an old house. But the Hop n Brew is a beloved Calgary hipster bar with what I am told is a fine selection of local beers. Did I miss anything? What is your favourite brewery, beer or place to drink beer in Calgary? Let me know in the comments below!